Public Dig Day this weekend! Fieldwork this season is proceeding apace. We have opened up two major areas for investigation. The first is within the footprint of 19th-century household. The second, on the southern portion of the site, is in a midden or trash pit area with a dense concentration of artifacts from the late 19th and early twentieth-century. Beneath that lays a thick, homogeneous deposit full of 19th century artifacts. This deposit may represent a privy for the two known houses on the site, or may in fact constitute evidence of a third major structure. Continued excavation will help to answer this question. 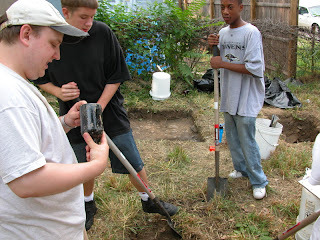 Project Co-Director Bob Chidester examines a hand-blown bottle recovered from the site while young Hampden residents Jonathan Ingram and Tyrek Greene begin work on a new excavation unit. 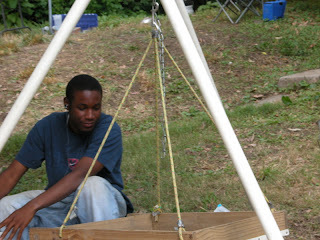 Tarrell Stokes of the Independence Local 1 School in Hampden listens to some tunes while he screens for artifacts. Here, a makers mark on the base of an Ironstone vessel reads, "warranted Balt. 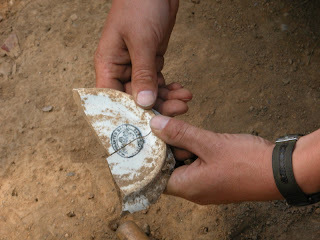 ", indicating the pot's local origins. 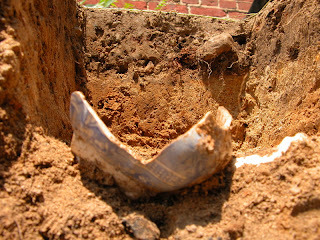 A transfer-printed tea vessel located beneath what was once the floor of the house in Area 1 speaks not only about the habits of Victorian people, but also hints at the class identity of the site's inhabitants. A number of artifacts have been recovered from fairly pristine deposits in this area, which Bob is expertly excavating. 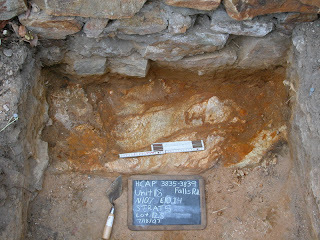 Here, excavation of a partial unit reveals the stone foundations of a standing house in an attempt to locate information about the construction date of the house being excavated.